C. cathayensis Sargent. "Shan he tao" (Mountain walnut). "He tao" (walnut); "Xiao he tao" (Small walnut); "Shan xie" (Mountain crab) (in Zhejiang province); and "Ye qi shu" (Wild lacquer tree) (in Anhui province). Chinese hickory. Chinese hickory was first described by Sargent (1916) based on collections by F. N. Meyer (Meyer 1521, collected July 8-12, 1915, maintained at U.S. Nat. Herb. and Gray Herb.). Sargent tentatively placed the species in the Section Apocarya, noting similarities between Chinese hickory and C. myristiciformis (the nutmeg hickory of North America) that "connect Eucarya and Apocarya, which without these intermediate forms might be considered distinct genera" (1916, p. 187). C. cathayensis is now considered to be part of Section Sinocarya (Cheng and R. H. Chang in Chang & Lu,1979), while C. myristiciformis is in Section Carya (Stone, 1997). Sargent (1916) considered his description to be the first of an Asian Carya species, since he rejected Dode's (1912) naming of C. sinensis (=Annamocarya sinensis Chevalier ), suggesting it to be Aleurites triloba instead. Chinese hickory is distributed in Zhejiang Province, making it the most eastern of Asian hickories. The species has been collected frequently in the Tien Mu Shan area near Chang Hua, Linan County, Zhejiang Province (Sargent, 1916; Stone, 1962). It has also been found in Chun An, Zhejiang (Stone, 1962). It is reported from southeastern Anhui Province (Kuang and Li, 1979). Specimens collected from Guizhou Province (Y. Tsiang 6467 and Handel-Mazzetti 2151) which had been identified as C. cathayensis are believed to be C. hunanensis, and have been annotated as such by Grauke. Chinese hickory is cultivated in Zhejiang Province, with much of the production coming from Linan County. According to Xu Rongzhang of the Linan County Forestry Institute, 16,000 Ha of trees produce 5000 tons of nuts. Most of the production comes from the area around Chang Hua, where 30% of the income is attributed to hickory. Most trees are wild, and are grown at densities of 15/mu (with 15mu/Ha, or 225 trees/Ha). Mature trees typically produce 30-50 kg/mu (450-750 kg/Ha). In test fields with improved methods, yeilds of 1470-3360 kg/Ha have been obtained. Important research objectives include: improving yields, improving fertility, enhancing pollination, and controlling pests. Graft compatibility between C. cathayensis and rootstocks of Platycarya, Pterocarya, and Cyclocarya was reported. Low survival of grafts (40%) was a problem, but could be due to a combination of factors, including grafting methods (greenwood grafts in current season), grafting season (may to September), culture (excessively crowded trees), or rootstock incompatibility. Nuts of Chinese hickory are eaten roasted and made into various candies. Oil from the nuts is used in cooking and in the production of paint (Kuang and Li, 1979), a use reflected in the common name for the tree in Anhui province. On October 8, 1990, we collected herbarium specimens and made observations on C. cathayensis growing in a planted stand from native seed. 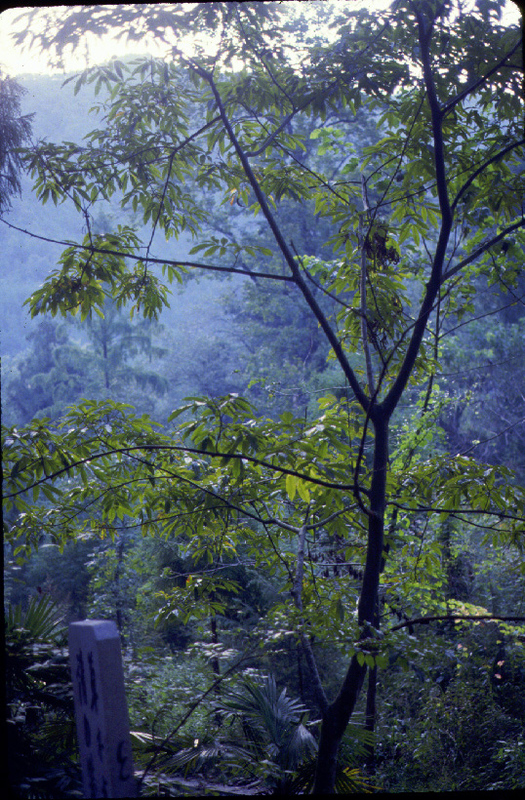 The trees were on the side of a mountain near Chang Hua, Zhejiang. Nuts had been previously harvested (Sept. 8-15) and none were found. The next day, we found native trees on the mountainside near Tien Mu Shan, but with very few nuts. Trees have smooth, white, tight bark. Like C. tonkinensis, Chinese hickory shoots terminate in orange leaf buds which lack bud scales. There are 5-7 leaflets on the odd-pinnately compound leaves. Leaves are generally 20-30 cm long, including the petiole. 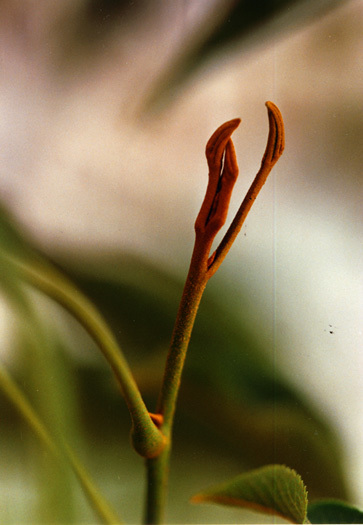 The petiole and rachis are covered by bright orange, round peltate scales which are concentrated at axils of petiolules and rachis, where acicular hairs are also present on the upper rachis. The terminal leaflet is equaled or exceeded in length by the two subjacent laterals (12-20 cm long X 3-6 cm wide), while the lower leaflets are smaller (6-12 cm long X 2.5-4.5 cm wide). Leaves are conspicuous for the rusty orange color of the lower surface, caused by the abundance of round orange peltate scales, which occur in two size classes. On the glossy green adaxial surface, primary veins are covered with abundant curly fasciculate hairs. Secondary veins have fewer hairs. The husks of the nuts are covered with the orange peltate scales and are 2-4 mm thick. 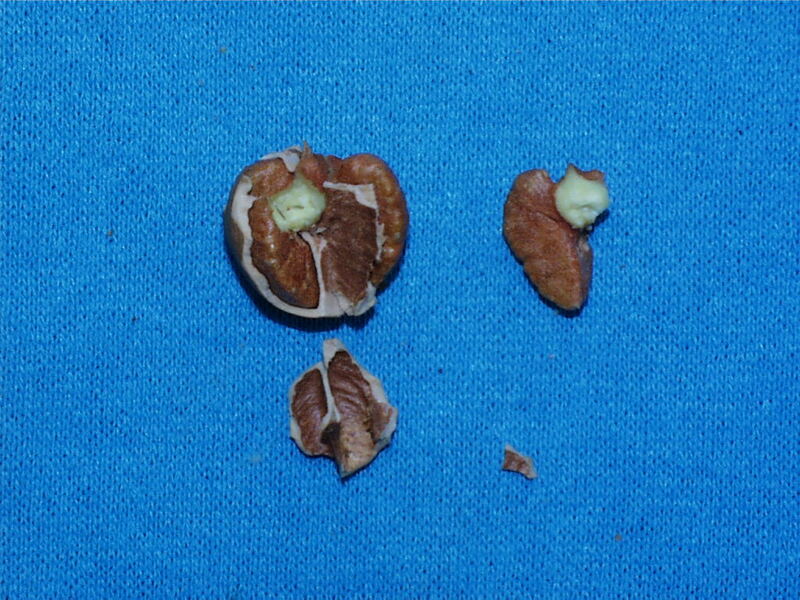 Husks are winged to the base of the nut along at least some of the 4 sutures. 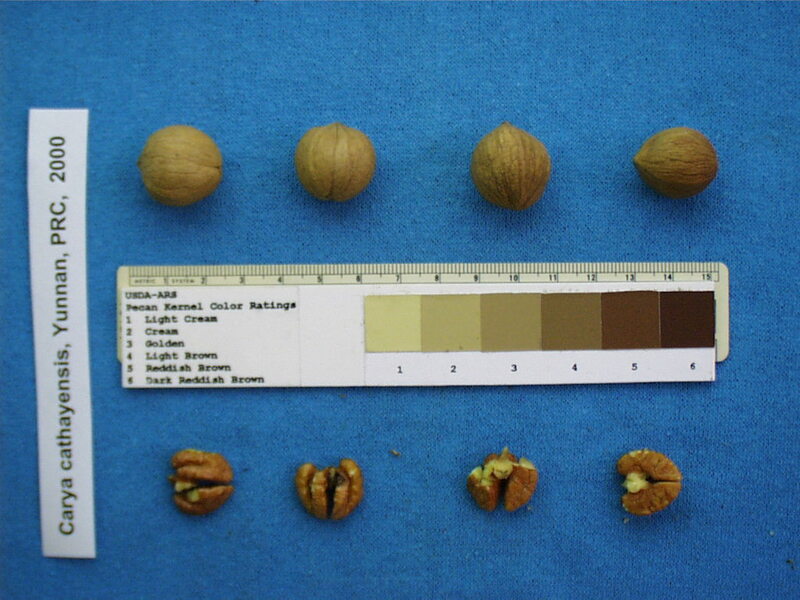 Nuts are generally round-elliptic with rounded base and acute apex (2-3 cm long X 1.5-2.3 cm diam.) and a shell 1-2 mm thick. Observed shell thickness was consistent with that reported by Stone (1962). Sargent's (1916) original report of 2.5-3 mm thick shells may be an error since he gave the same size range for both endo- and exocarp.